The Mohorovičić Discontinuity, commonly known as the “Moho”, is a seismically imaged acoustic interface within the Earth below which compressional wave velocities (Vp) exceed 8 km/s. In the ocean crust this step in seismic velocity occurs at 5-8 km depth and, away from plate boundaries and transform faults, the Moho is commonly a bright reflector. It is commonly assumed that the Moho also represents the boundary between mafic igneous rocks crystallized from magmas that form the crust and the residual peridotites of the mantle. To date, however, this interpretation of the Moho as the crust-mantle boundary has never been tested and there are geologically valid scenarios in which the Moho might exist at the boundary between mafic and ultramafic cumulates within the crust or below serpentinized peridotites that were previously part of the mantle until hydrated by seawater-derived fluids. Knowledge of the Moho, the crust-mantle boundary and the rocks of the upper mantle is fundamental to understanding the geodynamics and differentiation of our planet. The ultimate goal of Mission Moho was to drill completely through intact oceanic crust formed at a fast spreading rate into the upper mantle to understand the processes responsible for the creation of new crust, and determine the nature of the Moho and the mantle beneath. Fast spreading crust is relatively uniform, and we have well-developed theoretical models for crustal accretion at fast spreading ridges that can be tested by drilling. This would be the highest priority of an integrated "Mission" with short and long term goals, shallow and deep targets, and requiring both riserless and shallow to deep riser drilling. Throughout this Mission we would develop the scientific and technical knowledge to achieve a full crustal penetration. Many first-order questions about the processes of crustal accretion and interaction between the lithosphere and hydrosphere would be addressed on the journey to the Moho. A first-order understanding of the nature of the Moho and the crust also requires investigation of slow-spread crust. Selected regions on slow- and fast-spreading ridges where tectonics make lower crustal and upper mantle rocks accessible with current technology are thus compelling targets. 3) To drill as deep as feasible with riserless technology in Hole 1309D (Atlantis Massif, Mid-Atlantic Ridge, see location map), that has already sampled 1400 m of gabbroic rocks in young ( 2 Ma), slow-spread crust. This would provide essential operational experience in drilling hot plutonic oceanic crust, and complementary knowledge of lower crustal accretion processes at slow-spreading ridges. 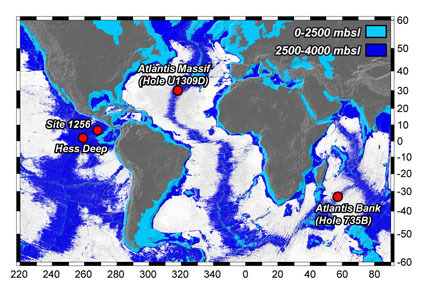 It might also provide a short-cut to sampling in situ fresh mantle rocks with >8km/s compressional wave velocities, and assess the spreading-rate dependence of the nature of the Moho. 4) To drill deeply at Atlantis Bank on the Southwest Indian Ridge (see location map), using both riserless and riser drilling, to test the model that the lower crust at this site is made of serpentinized peridotite, and that the Moho may in places be a serpentinization front. This site has a proven track record of benign drilling and the shallow water depth provides an excellent opportunity for testing deep riser drilling of oceanic basement using the current capabilities of D/V Chikyu, and to address important questions about the variability of the Moho and the crust-mantle boundary. 5) The “MoHole” : Full penetration and sampling of intact crust, Moho, and upper mantle in oceanic lithosphere formed at a fast spreading rate. This would provide hitherto unattainable information on the composition and melting of the upper mantle, the construction and cooling of the oceanic crust, the chemical exchange between the crust and oceans, and the linkages between these processes. Drilling the Mohole requires development of a 4000+ m riser for D/V Chikyu. 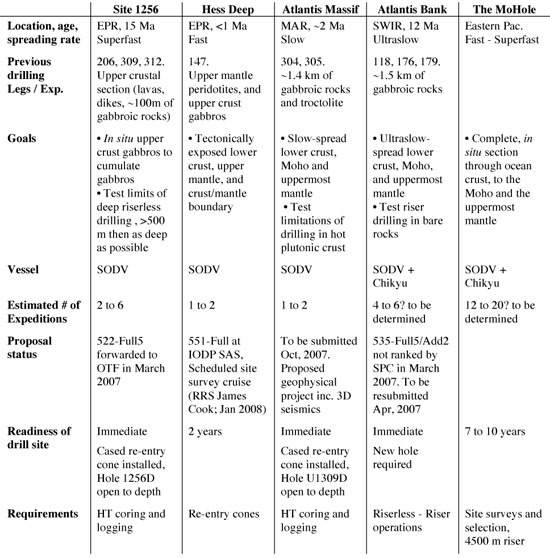 Although the optimal location for the MoHole has not yet been determined, the criteria for selecting a site are well established (see section 4.5). Knowledge gained from the drilling of targets 1 through 4, coupled with geophysical site surveys, would be necessary for choosing the site for full crustal penetration into the upper mantle. Ildefonse, B., Christie, D.M., and Mission Moho Workshop Steering Committee, 2007. Mission Moho workshop : drilling through the oceanic crust to the Mantle. Scientific Drilling, 4:11-18. doi:10.2204/iodp.sd.4.02.2007. Christie, D.M., Ildefonse, B., et al., 2006. Mission Moho - Formation and Evolution of Oceanic Lithosphere. Full workshop Report. Portland, Sept 2006, www.iodp.org/mission-moho-workshop. Ildefonse, B., Christie, D.M., Abe, N., Arai, S., Bach, W., Blackman, D.K., Duncan, R., Hooft, E., Humphris, S.E., and Miller, D.J., 2006. Meeting report : Mission Moho - Formation and Evolution of Oceanic Lithosphere. InterRidge News, 15 : 54-56. Christie, D.M., and Ildefonse, B., 2007. Mission Moho : Driling through the ocean crust to the mantle (workshop report). JOI News, Spring 2007, p. 11. Summaries of existing scientific drill holes into oceanic crustal and mantle rocks. [A] Penetration for all holes penetrating more than 50 meters into basaltic basement, as a function of spreading rate. Hole 1256D has reached the base of the sheeted dike complex at a shallower depth than the bottom of Hole 504B, which is still in sheeted dikes. Black = DSDP holes, blue = ODP holes, red = IODP holes. After Teagle et al. (2006). [B] Depth of penetration for all ODP and IODP holes deeper than 10 meters below seafloor into gabbroic rocks or residual mantle peridotite. Blue = dominantly gabbro, green = dominantly peridotite, white = no recovery. After Blackman et al. (2006).